Guillermo Figueroa is the principal conductor of the Santa Fe Symphony. He is also music director of the Music in the Mountains Festival in Colorado and was the former music director of the New Mexico and Puerto Rico symphonies. Appearances include the Toronto, Iceland, Chile, Detroit, New Jersey, and Tucson symphony orchestras. 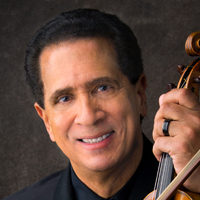 A renowned violinist as well, he was concertmaster of the New York City Ballet and founding member and concertmaster of the Orpheus Chamber Orchestra. He has performed the world premieres of violin concertos written for him by Mario Davidovsky, Harold Farberman, Miguel del Aguila, and Ernesto Cordero and received a Latin Grammy nomination in 2012.